Acanthopanax sieboldianus. Dr. Bernard Demes.exoten.dyndns.org (Accessed 4/2014). 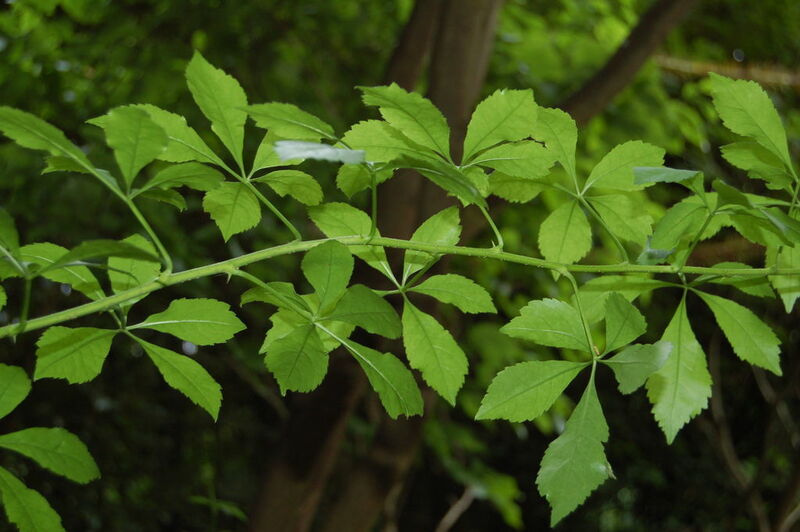 Leaves alternate, sometimes clustered at nodes, stalk to 8 cm, blade palmately compound, 5 or occasionally 7 leaflets, 2.5-3.5 cm long, 0.8-2.5 cm wide, oblong to widest above middle, pointed at both ends, dark green, margin coarsely toothed. Eleutherococcus sieboldianus flowers. asperupgaard.dk (Accessed 4/2018). 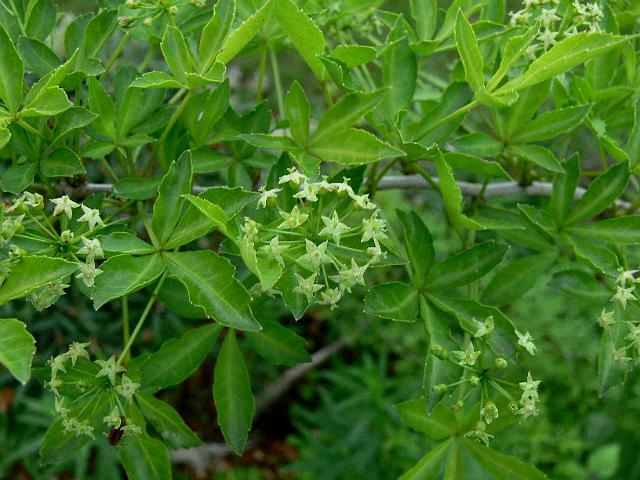 Flowers greenish-white, radially symmetrical, star-shaped, small, petals 5, pointed; inflorescence small, rounded, umbrella-shaped clusters, to 2.5 cm wide on a stalk to 10 cm long, sexes on separate plants. Fruit fleshy, black to 0.6 cm wide, seeds 2-5; rarely produced (Brand 2001). Notes: Apparently only female plants used in horticulture but shrubs spread vegetatively rather aggressively, shade tolerant (Dirr 1990; Rehder 1986).